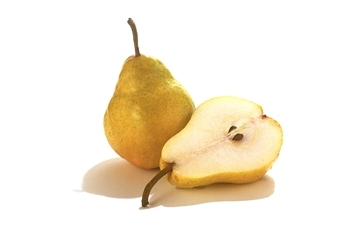 Pears are a great winter fruit, but you know how to tell if they are ripe? Simply check the neck of the pear, right next to the stem, by pressing gently with your thumb. If the yields to the pressure, then it’s ripe and ready to eat! As an excellent source of fiber and a good source of vitamin C, pears make a great snack at only 100 calories per serving. Thanks to Pear Bureau Northwest for the info.